Aberdeen welcomed new signing Tommie Hoban straight into the side for tonight’s Europa League visit of Burnley, deemed the ‘Battle of Britain’ before kick off. This was one of two changes, the other being Niall McGinn who rejoined the starting XI with Forrester and Wright dropping to the bench. Fellow new signing and former Partick Thistle goalkeeper Tomas Cerny also made the bench. The Clarets got things underway and the first five minutes were fairly frantic with both sets of players clearly excited by the occasion. It was The Dons who had the first half chance of the game created through Niall McGinn. The winger did well to beat Lowton down the left side and fire a cross straight across the face of goal. All it needed was for a red shirt to gamble and it would’ve been a simple tap in. At the other end Lennon looking lively down the right hand side, causing problems for Hoban who had assumed the left back position. On fourteen minutes, Burnley were forced into making a change in goal – Anders Lindegaard on for Nick Pope. The England international was forced off after he came off second best in an aerial battle with Cosgrove, landing awkwardly on his shoulder. Five minutes later Lindegaard was picking the ball out of his net after GMS gave The Dons the dream start they were after – converting from the penalty spot. German referee Daniel Siebert was well positioned to call a foul on Cosgrove by Matthew Lowton for a raised arm. At the other end, Joe Lewis was forced into making a brilliant save from point-blank range. Having had a relatively quiet first half Lewis was alert to stick out an arm to deny Jack Cork’s acrobatic diving head. The broke out to Lennon who fired in another threatening ball across but after a couple of deflections and heart in mouth moments The Dons were able to scramble the ball clear. Just the Clarets began to rise through the gears and pile the pressure on, The Dons nearly went up the other end and extended their lead. Once again it was GMS who burst through in behind and caught the Burnley defence off guard. He found Cosgrove who had done well to support the winger, the striker took the shot on early but substitute goalkeeper Lindegaard was equal to it. Shay Logan became the first Aberdeen player to go into the book after he was cautioned for a late challenge on, overstretched after coughing up possession. Aberdeen looked strong and were still creating chances on the hour mark. GMS had a golden opportunity to double the lead. After some fine work down the left-hand side McGinn’s cross was met by Cosgrove who nodded it down towards GMS. The winger got up well and his header looked destined for the top corner but for the outstretched arm of Lindegaard in goal. The resulting corner came to nothing with Shinnie attempting an audacious volley from the edge of the area which flew closer to the corner flag than the goal. Hendrick made way for Sam Vokes with just over 20 minutes to play. Sean Dyce switching to two up top. The aim was clearly to utilise the physical presence of Vokes and Wood up front. Vokes got his head on a couple of Stephen Ward crosses but he was unable to challenge Lewis in goal finding the side netting on the first occasion and heading straight down the throat of the Aberdeen keeper with his second attempt. 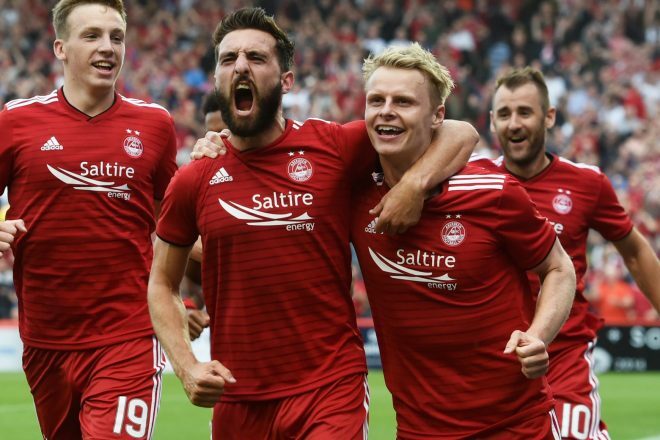 The game had turned into a real cup tie, with Burnley pressing and Aberdeen looking to pounce on the break – Niall McGinn went close again, cutting in from the left-hand side and firing a shot just wide of the far post.